Even though I have not had much time to enjoy it (since I was busy selling stuff on queensday, check out Nam Jai or my family blog), Amsterdam has a lot of blissful beauty to offer. This is already proven by the view from my balcony, but I would like to take this opportunity to also share with you: a frog. 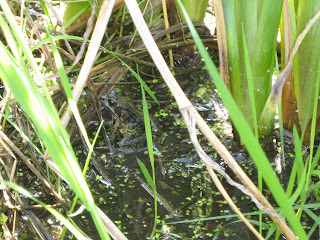 This example is but one of the many inhabitants of the pond in my mom's (enormous) backyard. Hooray for Amsterdam! Daily trainride - and a whole lot of music!